There I was. Living in downtown Brooklyn. An urbanite and proud of it. And I had a handicapped parking permit. Ostensibly, it was for driving Akiva, our youngest, who has special needs, around town – to appointments, grocery shopping at the Park Slope Food Coop, to play dates, and wherever else our adventures took us with his two older sibs, whom we homeschooled. I drew the line at parking in spots set aside for people with disabilities with the seated wheelchair symbol, but parking and not refilling the meter? That didn’t seem like such a big deal. After years of shlepping Akiva on the NYC subway system, (big surprise, it’s not that handicapped accessible), the permit was a big treat, a huge help. Akiva didn’t walk until he was 6, and once he grew out of the standard umbrella stroller, he needed a specialty stroller that weighed about 20lbs or so. I still have some lingering tendonitis in my elbow from the years of managing that stroller with said lovely child inside, along with a few changes of clothing and snacks for all three kids. The handicapped parking permit? It was my special “disability gift” from the City of New York. Feeling gifted by disability or enriched by disability and difference, is a hard topic to navigate. For parents rearing a child, it means admitting to and seeing the beauty and power of disability amid the very real and challenging struggles of raising and supporting that child, that teen, or that adult…everyday. In Solomon’s book, and it’s well worth the read, he spends countless hours learning about the culture of difference, along with the nature of the challenges faced, from physical to developmental, by parents and the individuals themselves. He explores what in today’s world we see as identifying characteristics, inherited from Mom and Dad, as opposed to difference, and how those issues play out. As parent to a child with a definite label, I’ve had to adjust to a title or label, Down syndrome, since he was an infant. Not just Down syndrome, but all the words that are associated with a syndrome that has the words retarded, mentally challenged, developmentally delayed, mongoloid, and slow, attached to it. Whether some of these terms are used or not anymore, many of them still live on in our consciousness – I’m always aware of this. And terms, titles and definitions make people curious as well, they want to know and to understand, to wrap their heads around what these words mean. Figuring out how to answer, how to appease their curiosity with respect and honesty is always complicated. As my child’s ambassador, an unexpected parental role, I’m always equally fascinated by questions about his abilities. If I tell them some of his true challenges, I wonder, will they assume that he’s a “lost cause” in terms of his future as a functioning and capable adult, albeit one with disabilities. If I “gild the lily,” so to speak, what will they think when they meet him for the first time? What has disability done for me? Seventeen years into the adventure, I still feel like a novice, surprised by the complexity of my feelings about my role as parent, supporter, advocate and educator. 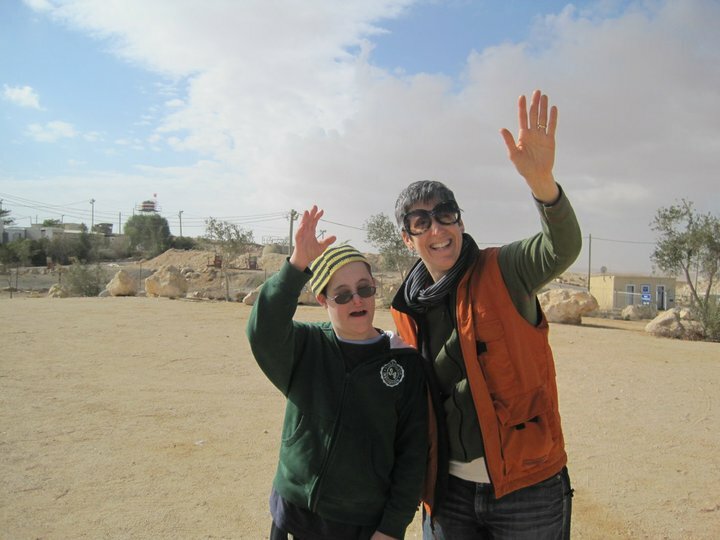 Disability has meant meeting wonderful teachers, therapists, social workers and just plain warm-hearted people who’ve been open and loving with us and Akiva from the beginning. Disability has meant new experiences and a different outlook on the world – on development, on handicapped accessibility, on life lived at a different pace. Disability has meant understanding what it means to be in a wheelchair, or to use adaptive equipment of any sort, to cope in a world not designed for people with any kind of difference. I am grateful to have the opportunity to be public about these issues – to speak and educate about the need for acceptance, for community, for inclusion for all. It’s exhausting, enlightening and even exhilarating. But you know, even though I now live in Israel, I still miss that handicapped parking permit. By Shutaf co-founder, Beth Steinberg. As someone with a disability living in New York I know that parking permit is a blessing. And I agree with you about the value of Solomon’s book. Do you find differences in attitude toward diasbility in Israel?